Home sweet home! I'm on my fourth washing load. I've emptied the bins that were overflowing (they must think the bins miraculously empty themselves!) I've swept up twigs, mud and leaves (dogs), I've wiped all the worktops which clearly hadn't been wiped in a whole week, yuk. The funny thing was that E said, proudly, 'we hoovered yesterday!' I resisted the urge to ask where they hoovered. Actually I won't bore you with the rest. Suffice to say it's going to be a week before I get the place reasonably hygienic once more. In the meantime, on the newly scrubbed kitchen workbench I have gathered my woolly acquisitions and photographed them to show you. 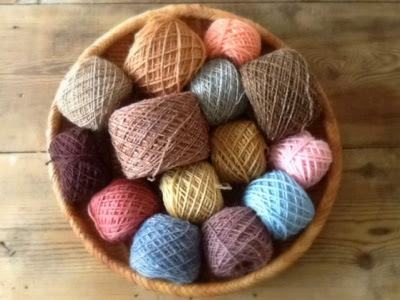 That dolly mixture of gorgeous tweedy yarns and muted wools was just £2 for the whole lot in a charity shop in Bexhill. I think some of it is Rowan sock weight yarn. 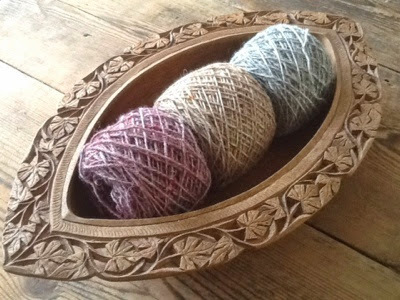 The unusual wooden oval bowl was also from a charity shop, just 99p, I loved the carving. You can never have too many bowls for creative use; I use them for my pins, tape measure, crochet hooks, whatever I'm using at any one time. 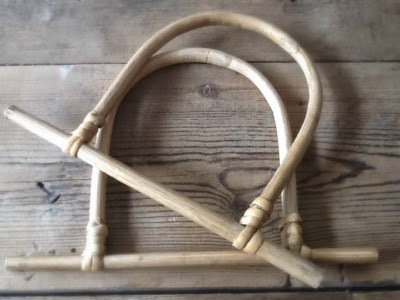 The handles have turned out not be the right size for a project I had in mind but I know I will use them at some stage. Before I tell you about the scrumptious Jaeger wool I must fill you in on the whole Uncle and Auntie thing. It is with some horror that I've found my children didn't really go along with the whole auntie and uncle thing when they were smaller. For relatives yes but not for very good friends of our parents like my brother and I were required to do when we we children. It doesn't seem to be the way of their friends and so I've let it go. Now that I'm (ahem) years old I do think it's time I dropped the Auntie and Uncle thing. In practice it's harder to drop the habit of a lifetime and so I bring you, Uncle R and Auntie F. You know who you are! AF won't mind me telling you that she is amazing when it comes to all things creative. Oh how I wish we lived closer. Spinning lessons? Tick. Rug making? Tick... I think the list is probably quite long. When there were murmurs of 'getting rid' of some supplies that were hanging around I didn't say no! (Jaeger wool!) In fact we had an impromptu rug making lesson at my Grandfather's party. I've picked up a couple of rug making books on my thrifty travels and never quite trusted the information that nothing needs to be knotted. 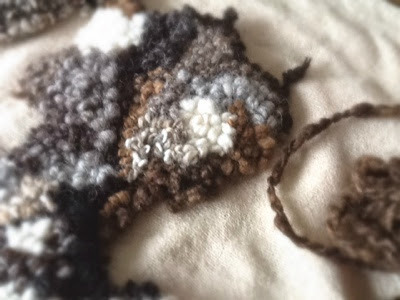 See pic 5, it's a square of old blanket and beautiful hand spun, undyed wool. Here, I must confess that I didn't hook all of this, in fact my bit is the slightly dodgy dark brown patch which proves I need a bit more practice. I can now see how it all holds together. I can also see this becoming quite addictive! 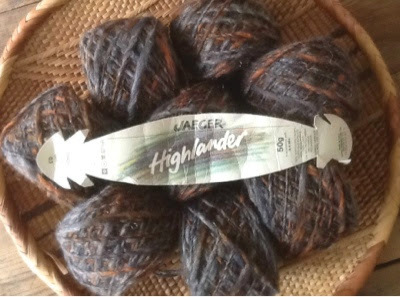 The Jaeger yarn looks like an aran weight and with about 400g to play with I've got a few ideas. I love this kind of wool, I call it 'slubby'. It's got a good wool content so I imagine I will be making a warm item with it. Not photographed is four 100g balls of Patons wool blend aran weight wool. £1.25! All different but natural shades. Two are grey shades and would work well with the Highlander. I'm thinking stripes, or patchwork squares. This is most definitely going to be back to front or random crochet. 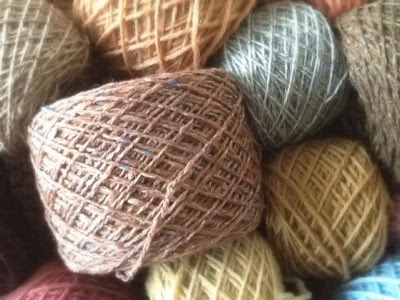 Acquire the yarn and then work out what to make with it as opposed to choose a pattern and buy the wool for it! Random is so much more fun! It's a bit like buses! Nothing for ages then several finds all in one day! And a mug, of course! A bargain buy! What good luck. I love the carved bowl.